The final decan of Aries arrives with a welcome taste of coppery sweetness, after the grip of martial iron in the first and the blaze of solar gold in the second. Venus gracefully descends, and for ten days she will hold court here. There has been conquest (2 of Wands), there has been government (3 of Wands); now comes the ritual celebration that crowns and bedecks a sovereign's reign. We have moved a step up the hierarchy of needs, and our thoughts turn from survival and functionality to beauty and adornment. Perhaps this is what the Golden Dawn meant when they named this card the Lord of "Perfected Work", or when Crowley called it "Completion". If you have never done it before, it is a shock to place the 4 of Wands between its two corresponding major cards - the Empress for Venus and the Emperor for Aries. There are the Lord and the Lady - and there they are again, rejoicing on "stage" in the 4 of Wands! It almost looks on purpose. No wonder so many readers associate the 4 of Wands with parties and weddings. Archetypally, the Empress and Emperor complete each other, and their union is worth celebrating. Something old, something new. Something red, something blue. His drive for structure matches her drive to create; he is the force to her form. In Mel Meleen's Tabula Mundi deck, which contains perhaps my favorite illustration of their partnership, he is the beehive and she, the bees. She is the circle to his compass, the nature to his artifice. 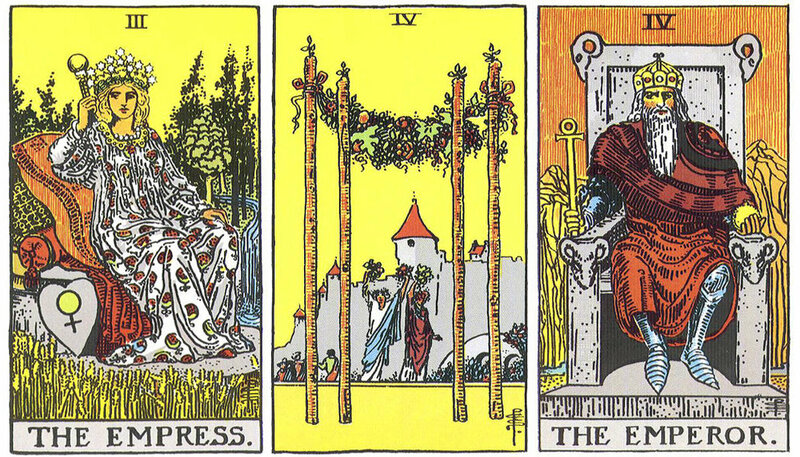 In the Rider Waite Smith card, we see what could be the 4 poles of a chuppah, the bridal structure of a wedding ceremony, representing the couple's new home. This, too, is a union of nature and artifice - a designed structure fashioned from natural materials, the wood and the garlands. It will not last forever, but for the moment its hospitality is open to all. This concept of opposites held in balance repeats throughout tarot - we see it in the 2 of Cups, the Temperance card, the Lovers, and others. In the more esoteric decks, opposition is represented as fire vs. water, red vs. blue, gold vs. silver. Of course, nothing is quite as simple as it seems. This is not quite a meeting of equals. The Empress and Emperor are not the cards of two planets, but of one planet and one zodiacal sign. Venus is passing through the House of Mars - his day palace, in this case. (His night fortress she will encounter in Scorpio.) Because Venus rules the decan, she has a place here. But in both of Mars' houses, she is also in detriment, her halo dimmed and her powers abated. In Scorpio she will self-medicate. Here in Aries, as my friend the astrologer Chris Warnock delightfully put it, she "spends like a drunken sailor". In other words, she may not be in her happy place, but she's gonna throw one hell of a party. Another way to think of Venus' guest room in the house of Mars is this: it's a moment of ease in an arduous time, a celebratory milestone on a much longer and harder road. This is the wedding party, not the long marriage. It is the roadside motel on the cross-country trip, the rental apartment, the therapist's couch. It is Rivendell, on the road to Mordor. Benefic Venus can make an unbearable moment tolerable, in the same way she makes a pleasant moment unforgettable. I call the 4 of Wands the card of temporary refuge or safe havens. The decan commentaries speak to the powers of adornment in this face: "subtle mastery and musical instruments," "games, meekness, clarity". Those ancient mystics who conjured the spirits of this decan found a masculine character softened by ornament. Over and over, we are told of a man dressed in red, with a gold bracelet. He is Ares, and Aphrodite is trying to give him a wardrobe makeover. He humors her - for now. Indeed, according to those same magicians, this spirit "wishes to do good but cannot". Perhaps these two forces, Love and War, can never be truly reconciled. Perhaps it is a foreshadowing of the threadbare 5 of Disks to come. The roses cut for the party will wither tomorrow. The chuppah is not a house - it's only the symbol for a house's permanence. The performance before us on the stage is not the same as real life. But if we didn't go through the performance - if we didn't engage in the theatre, if we didn't speak through art, where would we be? 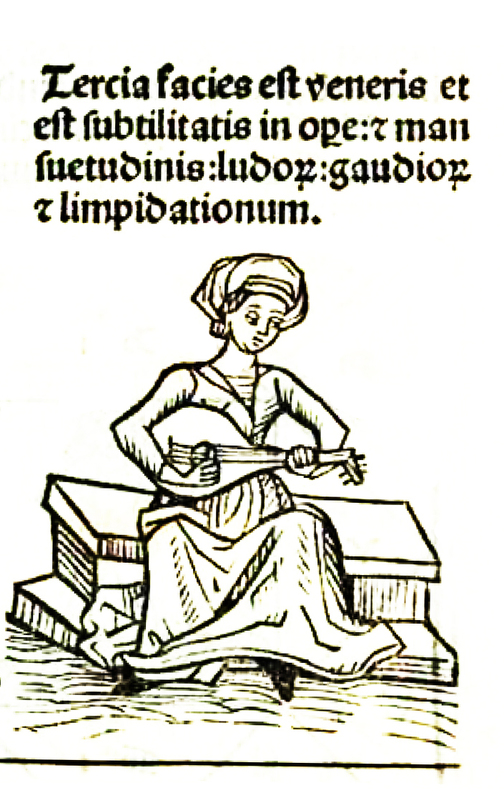 Magicians play-act their way through a working - not because Asmodeus or Orobas is fooled by the paper crown, but because its power is not diminished by being merely a symbol; in fact, its power is increased. So, too, may we conjure for peace in a time of seemingly limitless aggression. When you draw the 4 of Wands, take pleasure in its sweetness and whatever celebration it offers. If you have been suffering, take comfort in its refuge. Although it will not last beyond tomorrow, the moment has a symbolic power. The symbol of hope perpetuates hope; the loss of the symbol annihilates hope. So cherish the symbol for what it represents, rather than being disappointed in it for being only a representation rather than the reality.